This article should be cited as:"Michael Huckabee", by Will Johnson, professional genealogist wjhonson@aol.com, at CountyHistorian.com URL: http://www.countyhistorian.com/cecilweb/index.php/Michael_Huckabee, copyright 2007-8, all rights reserved. Michael Dale "Mike" Huckabee was born 24 Aug 1955, in Hope, Hempstead County, Arkansas, to Dorsey Wiles Huckabee (1923-96) and May Elder (1925-99). Mike Huckabee married Janet McCain on 25 May 1974, and they had three children: John Mark Huckabee, David Huckabee and Sarah Huckabee. Mike Huckabee is a Baptist minister and the author of several books. Mike Huckabee was Governor of Arkansas from 1996 to 2007. He is currently running for President of the United States as a Republican. 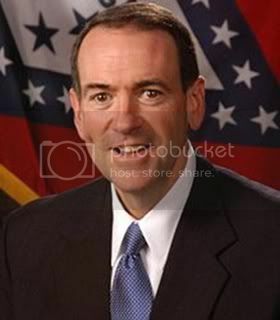 Encyclopedia of Arkansas states "Mike Huckabee was born on August 24, 1955, in Hope (Hempstead County), the son of Dorsey W. and Mae (Elder) Huckabee." Dorsey Wiles Huckabee was born 17 Jul 1923 in Hope, Hempstead County, Arkansas to Virgil Huckabee and his wife Ernie Betts. Dorsey married May E Elder. She was born 14 Dec 1925, also in Hope. Dorsey died 31 Mar 1996 at his home in Texarkana, Bowie County, Texas. May died in Bryant, Arkansas on 30 Sep 1999. Both are buried and have tombstones in Memory Gardens Cemetery, in DeRoane Township, Hempstead County, Arkansas. Texarkana Gazette, obituary "Dorsey Huckabee" : "Dorsey Wiles Huckabee, 72 of Texarkana, Ark., died Sunday, March 31, 1996, at his home. Mr Huckabee was born July 17, 1923 in Hope, Ark. He was retired from the Hope Fire Department and the Arkansas State Highway Department and a member of Beech Street First Baptist Church. Survivors include his wife Mae Elder Huckabee of Texarkana, one son and daughter-in-law, Mike and Janet Huckabee of Texarkana, and daughter and son-in-law, Patricia and Jim O Harris of Texarkana; one sister, Joyce Mross of Hope; and five grandchildren, John Mark Huckabee, David Huckabee, Sarah Huckabee, Chip Harris and Katie Beth Harris of Texarkana. Services will be 11am today at Beech Street First Baptist Church with Mike Huckabee and the Rev. Roy Parker officiating. Graveside services will be 2pm today in Memory Gardens Cemetery, Hope. The family will be at 47 Broadmoor, Texarkana, Ark. Memorials may be made to KLFI TV, PO Box 1469, Texarkana, Ark, 71854 or Ark-La-Tex Home Health and Hospice, 6500 N Summerhill Road, Texarkana, Texas 75503"
May E Elder was born 14 Dec 1925 in Hope, Hempstead County, Arkansas the daughter of William Thomas Elder by his second wife Eva Lorene Whitney. May married Dorsey Huckabee and they had at least two children: Mike and Patricia. May Elder died 30 Sep 1999 in Bryant, Arkansas and is buried and has a tombstone in Memory Gardens Cemetery, DeRoane Township, Hempstead County, Arkansas. Texarkana Gazette, obituary "Mae Huckabee" : "Mae Elder Huckabee, 73, of Bryant, Ark., formerly of Hope, died Thursday, Sep 30, 1999, in a Bryant nursing home. Mrs Huckabee was born Dec. 14, 1925, in Hope. She was retired from Louisiana/Nevada Transit Co. and a member of Church at Rock Creek, Little Rock. She was preceded in death by her husband, Dorsey W Huckabee on March, 31, 1996. Survivors include one son and daughter-in-law, Gov. Mike Huckabee and Janet Huckabee of Little Rock; one daughter and son-in-law, Patricia L "Pat" and Jim Harris of Bryant; three sisters, Louise Casey of Fort Worth, Texas, and Vena Shores and Emilie Prescott of Hope; and five grandchildren. Services will be 10am Saturday at Brazzel/Oakcrest Funeral Home Chapel with the Revs. Mark Evans and Rick Caldwell officiating. Private burial will be in Memory Gardens. Visitation will be 6pm to 8pm today at the funeral home. In lieu of flowers, memorials may be made to Arkansas Hospice, 2200 Fort Roots Drive, North Little Rock, Ark., 72114-1709"
1910 Census of Idabel, McCurtain County, Oklahoma showing Lucius Huckabee, age 33, and his wife Lula age 31 with five children including "Virgie" age 9 all born AR. 1920 Census Jackson, Little River County, Arkansas showing Virgil age 19 as a son of L E Huckabee age 43 and Lula age 41. SSDI showing Virgil Huckabee 16 Jan 1901 - Oct 1978, last residence Hope, AR. SSN issued by Arkansas. 1920 Springhill, Hempstead County, Arkansas showing : "Lucious L Betts, 49; Sarah F 47; Alvin F 21; Ernie J 17"
SSDI showing : "Ernie Huckabee, born 15 Apr 1902, died 14 Apr 1992, issued by Arkansas"
William Thomas Elder was born 12 Jul 1868 in Columbia, Adair County, Kentucky to Granville Elder and his wife Sarah J Unknown. He served during the Spanish-American War. He married firstly to a fellow Kentucky-native, Mary L "Mollie" Murrell in Adair County, Kentucky on 23 Sep 1903. They had two known children: Garvin Elder (1904-1968) and Earl Elder (1905-). (Earl was in the US Coast Guard in Baltimore, Maryland in 1945). Mary died between the 1910 census, when they are all enumerated in Menard County, Illinois and the 1920 census, when the family is enumerated in Nevada County, Arkansas. If they had any more children, they must have died young as they are not on the 1920 census with William. William Thomas Elder died 8 Mar 1945 in Springhill Township, Hempstead County, Arkansas. He is buried in Huckabee Cemetery in Springhill. His widow Eva remarried to a Mr. Garner which is the surname under which she died. Kentucky Marriage Records, 1852-1914 : "W T Elder, 34 to Mollie L Murrell, 17, Adair County, Kentucky 23 Sep 1903"
1910 Census of Indian Creek, Menard County, Illinois : "William Elder, 40, KY/KY/Unknown; Mary 23, KY/KY/KY; Garvin, 5, son, KY; Earle, 4, son, KY"
1920 Census of Missouri Township, Nevada County, Arkansas : "William T Elders [sic], 51, KY/KY/KY; Garvin Elders, 15, KY; Earl Elders, 14, KY"
Arkansas Death Index, 1914-50 showing : "William Tho Elder, died 1945 Hempstead County, age 75"
Eva Lorene Whitney was born 9 Feb 1904, daughter of Charles Oliver Whitney and his wife Sarah Ablacur Sickler, probably in or near Decatur, Macon County, Illinois as her obituary calls her a "native of Decatur, Illinois". When her mother Sarah died in 1910, Eva's widowed father married his sister-in-law Minerva Sickler that same year. Eva married William Thomas Elder (1868-1945), evidently as his second wife when she was about 21. The family lived in Hope, Arkansas in 1925. They had seven children: May, Neal, Louise, Elsie, Vena, Emilie, and William Thomas Jr.
After William Thomas Elder died, Eva remarried to a Mr. Garner which is the surname under which she died on 2 Jan 1989. 1910 Census of Long Creek, Macon County, Illinois showing : "C O Whitney 44, married for 18 years, IL/KY/IL, Grocery; Sarah 44, married for 18 years, mother of 9, 8 living, IL/NJ/IL; George 16; Charles 14; Mary 11; John 9; Eva 6; James 3; Robert 1; Douglas Rock 26 half-brother, IL/IL/IL, Laborer, Ditching"
1920 Census of Alabama Township, Nevada County, Arkansas showing : "Charles O Whitney 54 IL/KY/IL; Minerva 51 IL/NJ/IL; Hixey 21, daughter, IL; John 19, son, IL; Eva 16, daughter, IL; James 13 son, IL"
Lucius E Huckabee was born 6 Aug 1876 in Arkansas, probably in Hempstead County to Berryman Huckabee and his wife Rebecca Dudley. He married Lula McKee on 28 Dec 1898 in Hempstead County, Arkansas (Marriage book M, pg 379). Lula was born 22 May 1878. She died in 17 Jun 1944 in Hope, Arkansas. He remarried in 1947, a widow named Rebecca "Becky". He died 2 Aug 1970. They are buried side-by-side at Huckabee Cemetery, near Hope, in Hempstead County, Arkansas. 1880 Census of Spring Hill, Hempstead County, Arkansas showing Lucius E Huckabee age 3 as a son of Berry Huckabee age 28 and Rebecca A age 29, both born in Georgia. 1900 Census of Springhill, Hempstead County, Arkansas showing Lucious E Huckabee age 23 as son-in-law of William McKee age 61. WWI Draft Registration Card showing Lucius Elmore Huckabee born 6 Aug 1876, resident of Hope, registered in Hempstead County, Arkansas, nearest relative Lula Huckabee. Red hair, blue eyes. Lula McKee was born 22 May 1878 in Arkansas, (perhaps in Nevada County where they lived in 1880,) daughter of William James McKee and his wife Emily Josephine Garner. On 28 Dec 1898 in Hempstead County, Arkansas, she married Lucius E Huckabee (Marriage book M, pg 379). Lula McKee died on 17 Jun 1944 in Hope, Hempstead County, Arkansas. She is buried in the Huckabee Cemetery in Springhill Township, Hempstead County, Arkansas. 1880 Census of Taylor Township, Nevada County, Arkansas showing : "W J McKee, 42; Efe 32; John H 11; Mary L 9; Elijah F 7; Leander 5; Lula 2"
Lucius Columbus Betts was born 14 Aug 1871 at Hog Mountain, Gwinnett County, Georgia, the son of Redick H "Redie" Betts and his wife Nancy A Unknown. Lucius married Sarah F Wilson on 8 Dec 1892 in Hempstead County, Arkansas and they had a number of children there. Lucius died 10 May 1944 in Springhill, Hempstead County, Arkansas. 1910 Census of Springhill, Hempstead County, Arkansas showing : "Lucius Betts, 40, married first time, 17 years ago, GA; Sarah 36, married first time, 17 years ago, mother of 7, 6 living, GA; Susie daughter 16 AR; Calvin son 14 AR; Paria daughter 13 AR; Alvin son 11 AR; Virgie daughter 9 AR; Ernie daughter 7 AR"
1920 Springhill, Hempstead County, Arkansas showing : "Lucious L Betts, 49 GA; Sarah F 47 GA; Alvin F 21 AR; Ernie J 17 AR"
Sarah F Wilson was born about 1872/3 in Georgia. Lucius Columbus Betts married Sarah on 8 Dec 1892 in Hempstead County, Arkansas and they had a number of children there. The family was living in Columbia, Adair County, Kentucky in 1868 when their son William Thomas Elder was born there that year. Charles Oliver Whitney was born 6 May 1865 in Menard County, Illinois, son of Scott Macine Whitney by his wife Mary Ann Bell. His father Scott may have died sometime between 1864 and 1867, since on 18 Mar 1867, Mary married secondly to Michael Rock in Menard County, Illinois. In 1870 and 1880 the family is enumerated living in Menard County with Michael Rock as the head of the family. Evidently Charles was the only surviving issue from his mother's first marriage. Interestingly, Mary is remarried as Mary Bell not Mary Whitney, this may indicate the possibility that Scott did not die, but rather that he and Mary divorced. On 23 Feb 1891, in Petersburg, Menard County, Illinois, Charles married firstly, on 23 Feb 1891 in Menard County, Illinois to Sarah Ablacur Sickler. They had at least or exactly nine children: Minnie Laura Whitney 1891/2, George Allen Whitney 1893/4, Charles Scott Whitney 1895/6, Jazer Harry Whitney (infant), Mary Ann Whitney 1897/8, John William Whitney 1900/1, Eva Lorene Whitney 1903/4, James Douglas Whitney 1906/7 and Robert Francis Whitney 1908/9. In 1910, where the family was enumerated living in Long Creek, Macon County, Illinois, Sarah states that she is the mother of 9 children, 8 of whom are still living. Sarah died later that same year. Charles then married secondly, her sister Minerva Sickler. By 1920 the family had moved to Alabama Township, in Nevada County, Arkansas. They may have later moved to Hope, Arkansas as Charles died there on 7 Feb 1937. His second wife Minerva died in 1940. Charles and both of his wifes are buried in the Spangler Cemetery in Macon County, Illinois. Illinois Statewide Marriage Index showing : "Seath M Whitney to Mary A Bell 7 Dec 1863, Book A, page 253 Menard County"
Illinois Statewide Marriage Index showing : "Michael Rock to Mary Bell 18 Mar 1867, Book A, page 316, Menard County"
1870 Census of Petersburg PO, Township 19, Range 7, Menard County, Illinois showing : "Michael Rock 35; Mary A 28; James 11; John 2; Henry 3/12; Chas Whitney 6"
1880 Census of Indian Creek, Menard County, Illinois showing : "Michael Rock 50; Mary B 39; James 20; John 12; Edward 10; Jane 7; Anna 4; Charles Whitney 16 step-son; Lydia Bell 58 mother-in-law; Eli Bell 18; Jane Yarnold 14 granddaughter"
Illinois Statewide Marriage Index showing : "Charles O Whitney to Sarah A R Sickler 23 Feb 1891 Menard County, Illinois"
1900 Census of Long Creek, Macon County, Illinois showing : "Charles O Whitney 35; Sarah A 34; Minnie L 8; George A 6; Charles S 4; Mary A 2; Walter Baum 12 Cousin"
"Sarah Whitney" in the Spangler Cemetery records, Macon County, Illinois showing : "Sarah Whitney, born 1865, died 1910"
"Charles Whitney" in the Spangler Cemetery records, Macon County, Illinois showing : "Charles Whitney born 1865, died 1937"
"Minerva Whitney" in the Spangler Cemetery records, showing : "Minerva Whitney born 1868, died 1940"
Sarah Ablacur Sickler was born about 1865/6 in Illinois, the daughter of Robert Sickler by his wife Mary. She married, as his first wife, on 23 Feb 1891 in Menard County, Illinois to Charles Oliver Whitney (b 1865), a native of that place. They had at least or exactly nine children: Minnie Laura Whitney 1891/2, George Allen Whitney 1893/4, Charles Scott Whitney 1895/6, Jazer Harry Whitney (infant), Mary Ann Whitney 1897/8, John William Whitney 1900/1, Eva Lorene Whitney 1903/4, James Douglas Whitney 1906/7 and Robert Francis Whitney 1908/9. Scott Sickler, a site visitor, informs me that the parents of Sarah and Minerva were Robert F Sickler and his wife Mary J Sheppard, and directs me to the 1870 and 1880 census of Tazewell County, Illinois for confirmation. He further states that Mary (Sheppard) Sickler died Jan 1909 in Edmond, Oklahoma. Charles' second wife Minerva died in 1940. Charles and both of his wifes are buried in the Spangler Cemetery in Macon County, Illinois. 1880 Census of Washington, Tazewell County, Illinois showing : "Mary Sickler 40, widow, weaves carpet, IL/OH/IN ; Sarah 14 IL/NJ/IL; Minerva 12 IL; Jazer 9 IL"
Arkansas Marriages 1851-1900 showing "Persyman Huckabee to Rebeccah Dudley 7 Nov 1872 Hempstead County, Arkansas"
1920 Census of Springhill, Hempstead County, Arkansas showing Rebecca Huckabee, age 66, as mother-in-law to Jim McKee and his wife Kate 33 born Georgia. William James McKee was born 1838/9 in Georgia. He married Emily Josephine Garner. 1870 Census of Smith, Columbia County, Arkansas : "William J McKee, 30; Emma J 21; John W 2"
1900 Census of Springhill, Hempstead County, Arkansas showing : "William McKee 61 GA, Lucious E Huckabee 23 son-in-law, Lula Huckabee 28 daughter, James A McKee 16 son, Clide Huckabee 7/12 grandson"
Emma Josephine "Emily" Garner was born about 1849 in Georgia. She married William James McKee. 32. William M Huckabee was born 22 Jan 1817 in Buncombe County, North Carolina, the son of Berryman Huckabee and Elizabeth unknown. On 8 Oct 1835 he married Nancy Williams in Carroll County, Georgia (Marriage Book C, Page 54). William died 30 Nov 1876 in Hope, Hempstead County, Arkansas. 33. Nancy Williams was born 17 Sep 1817. She died 11 Nov 1899 in Hope, Hempstead County, Arkansas. She is buried at the Huckabee Cemetery in Hope, Arkansas. 64. Beraman M "Berryman" Huckabee was born about 1795 in Virginia and moved early to North Carolina. It's not yet known whether he married his wife Elizabeth in North Carolina, but William M Huckabee one of their sons was born there in 1817. The family by 1832 had moved to Carroll County, Georgia where their son Isaac Huckabee was born that year. This section comes from published, secondary, reliable sources. This page was last modified on 25 January 2010, at 00:43. This page has been accessed 746,774 times.